If the transmission is in 4th, 5th or 6th gear during a transmission electrical componentfailure, the transmission will default to 5th gear. All solenoids will default totheir normal state. If the torque converter clutch was applied, it will release. Thetransmission will stay in 5th gear default range until the ignition has been turnedoff or transmission shifted to reverse. When the vehicle is restarted, and shiftedback into drive,the transmission will then operate in the 3rd gear default range. This default actionwill enable the vehicle to be safely driven to a service center. The 35R-pressure control solenoid-2 defaults to ON, allowing actuator feed fluid toenter the pressure control solenoid-(PCS)-35-reverse clutch fluid circuit. PCS-35-reverseclutch fluid is routed through orifice-#36 and then to the 3-5-reverse clutch regulatorvalve. PCS-35-reverse clutch fluid is also routed through orifice-#37 and then tothe 3-5 reverseclutch boost valve. PCS-3-5-reverse clutch fluid pressure acts on a differential area moving the PCS-3-5-reverseclutch boost valve against the 3-5-reverse clutch boost valve spring. The 3-5-reverseclutch fluid passes through the valve and enters the 3-5-reverse clutch feedback circuit.As PCS-3-5-reverse clutch fluid pressure is increased to a given value, the 3-5-reverseclutch boostvalve opens the 3-5-reverse clutch feedback circuit to exhaust. This results in the3-5-reverse clutch regulator valve moving to the full feed position sending full 3-5-reverseclutch feed pressure (full line pressure) to the clutch. PCS-3-5-reverse clutch fluid moves the 3-5-reverse clutch regulator valve against3-5-reverse clutch regulator valve spring force and 3-5-reverse clutch feedback fluid.This allows 3-5-reverse feed to pass through the valve and enter the 3-5-reverse clutchcircuit. The 3-5-reverse clutch fluid is then routed to the 3-5-reverse clutch, the3-5-reverse boost valve andthe clutch select valve-2. When the 3-5-reverse clutch regulator valve is in thisposition, PS2-fluid from the pressure switch-2 exhausts through the valve, allowingthe switch to close. Once the clutch select valve-3 is moved to the ON position in 4th-gear, it will remainin this position throughout the 5th-gear default range, until the ignition has beenturned OFF. When the ignition is OFF, fluid will exhaust from the valve, thus whenthe vehicle is restarted, the transmission will then be in the 3rd-gear default range. 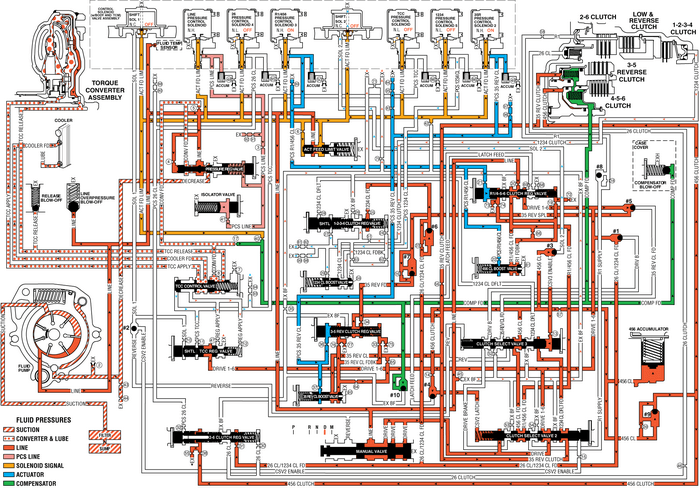 If the transmission was in 4th-gear when an electrical condition commands a protectionmode, the 1234-pressure control solenoid-5 defaults to the OFF position, allowingPCS-1234 clutch fluid from the 1-2-3-4-clutch, the 1-2-3-4-clutch regulator valveand 1- 2-3-4-clutch boost valve to exhaust. If the transmission was in 6th-gear when an electrical condition commands a protectionmode, the 26-pressure control solenoid 4 defaults to the OFF position, allowing PCS-26-clutchfluid from the 2-6-clutch regulator valve, and the 2-6-clutch to exhaust. The torque converter clutch-(TCC) pressure control solenoid will default to it's normalstate, OFF. PCS-TCC-fluid will exhaust from the TCC-control valve, and spring forcewill shuttle the valve to the off position. TCC-apply fluid will then be routed tothe cooler, and TCC-release fluid will be routed to the torque converter for completeTCC release. The 1234 clutch regulator valve spring force moves the valve to allow 1234 clutchfeed fluid to enter the PS1 fluid circuit which opens PS1 switch. The 1234 clutchfluid passes through orifice #51 to the 1234 clutch regulator valve, through orifice#26 and enters the exhaust backfill circuit.